When you first glimpse the Gristlemaster, it is as if some eldritch dark magic compels your eyes to fix themselves on the small button between the volume and tone knobs. Do not resist, for this button is the secret to the Gristlemaster's immense power. It's part of Greg Koch's Signature Gristle-Tone Fishman Fluence pickups, and it allows the Gristlemaster to cover a wide swath of tonal territory. If you're not familiar, Fishman's Fluence pickups use an innovative design that promotes versatility, fixes a few annoying problems, and generally makes for an ideal playing experience. Basically, the coils are printed on a circuit board rather than wound around a bobbin. Forty-eight of these circuit boards form one Fluence Core, and each pickup has two Cores. This new-fangled design is sure to delight you when you plug in. There's almost no hum, and the guitar responds to your touch just a hair faster. But, most importantly, the Fluence core design allows you to have TWO tones in one pickup. That's where the aforementioned comes in. Because of this small metal circle, the Gristlemaster is a shapeshifter that can go back and forth between two of the greatest single-coil sounds in the history of recorded music. Back in the 1950s, a small boutique guitar manufacturer in California developed some of the first solid-body electric guitars. 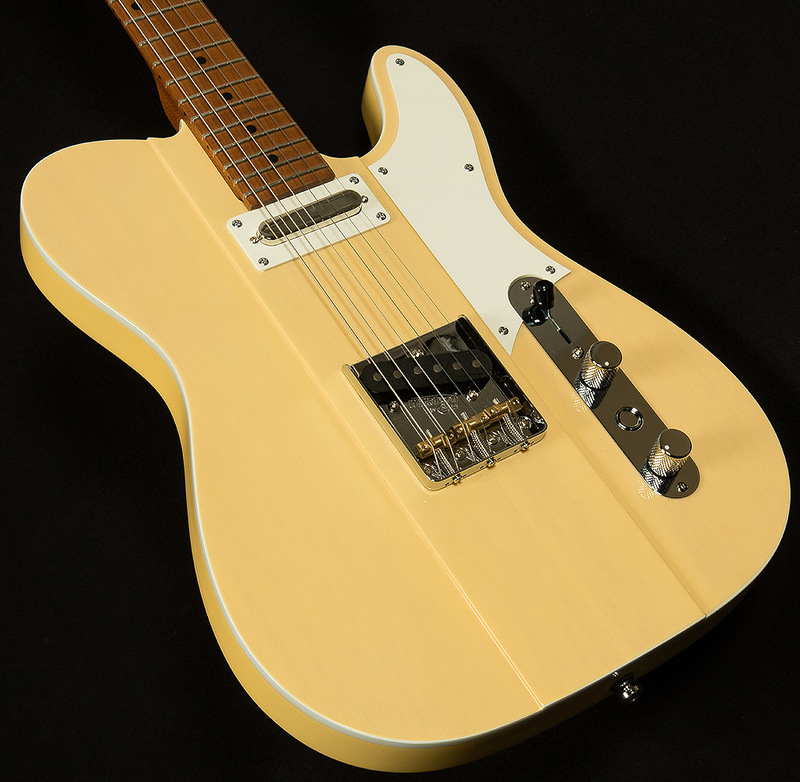 Early examples had black pickguards, and they switched to white in 1954. The "blackguard" guitars were renowned for their hotter, darker tone with extra midrange snarl. By contrast, the "whiteguards" had an open, airy tone with a bit more twang--a sound that became the foundation of many classic country songs. The button on the control plate of the Gristlemaster allows you to toggle between these two iconic sounds at will. And goodness gracious, both voices sound glorious! Fishman's Gristle-Tone pickups really capture the spirit and vibe of those original designs. Voice one, the whiteguard, is indeed open and airy. It excels at anything country or country-adjacent, but it can do so much more. Its clarity and chime make strumming chords a delight in any musical context. Indie rockers will especially love this sound in clean jangly situations, but it also produces a lovely sparkly crunch in high-gain settings. The blackguard voice is muscular, throaty, and warm, with thick midrange, stinging highs, and sculpted bass response. It snarls, it bites, it screams, it wails, and it punches with exceptional ferocity. Obviously, these tendencies are well-suited to rock and roll and harder, heavier forms of music. Nevertheless, when you flip to the clean channel, the blackguard's warm resonance and vocal timbre will no doubt inspire all manner of thoughtful, lyrical leads and smooth, mellow chord progressions. Or, you may just want to shred. Either way, you'll have a blast! Next, the Gristlemaster's incredible build quality will jump out at you. When you sit down with The Gristlemaster, Reverend's impeccable craftsmanship and attention to detail are immediately apparent. A guitarist like Greg Koch needs a guitar with righteous build quality to withstand the onslaught of fretboard savagery that spills forth from his mighty hands, and the Gristlemaster is up to the task. Reverend's classic medium oval neck profile is as comfortable as your favorite pair of old sweatpants, and the freatboard has a Compound 10"-14" radius to allow for low setups and easy bending. And, with its pin-lock tuners and Boneite nut, changing strings on the Gristlemaster is a breeze, and its tuning stability is top-notch. All of the above are tactile features that you can feel, but there is more than meets the eye (and the hand!) to the Gristlemaster. There is a veritable plethora of enhanced components that make for an otherworldly playing experience beneath the hood. For instance, most jacks have one contact point, but the Pure Tone jack has two for better audio quality, reliability, and grip. Also, you can find a treble bleed circuit in the volume knob, which keeps your highs present when you roll of the volume--crucial for pedal steel tricks and other Kochian volume knob tomfoolery. Speaking of knobs, both the pots and caps in this beast are boutique quality. Where most caps and pots have a +-20% rating, Reverend's have +-10% ratings. They're built to tighter specifications, and that means more consistent sound quality. All of these myriad rough-and-ready appointments add up to a ridiculously dependable instrument that can perform at the highest level in any situation: three-hour gigs, marathon recording sessions, naval battles, day-long practices, medieval siege warfare, the list goes on and on. Back in the woods, you get lost playing the Mansquatch's Gristlemaster and exploring its many features. You sit on a log playing until the sun peeks over the distant treetops. When you finally come to and look around, you realize that The Greg has wandered off into the woods, leaving you alone with the guitar. You look down at the Gristlemaster. It is sturdy enough to suit a Viking warlord with a name like Skorsgard the Skullcrusher, but it is full of inspiring sounds. It almost seems unfair that a guitar should be so dependable AND have such killer tones on tap. There is no answer, because it's rhetorical question, albeit a loud one. 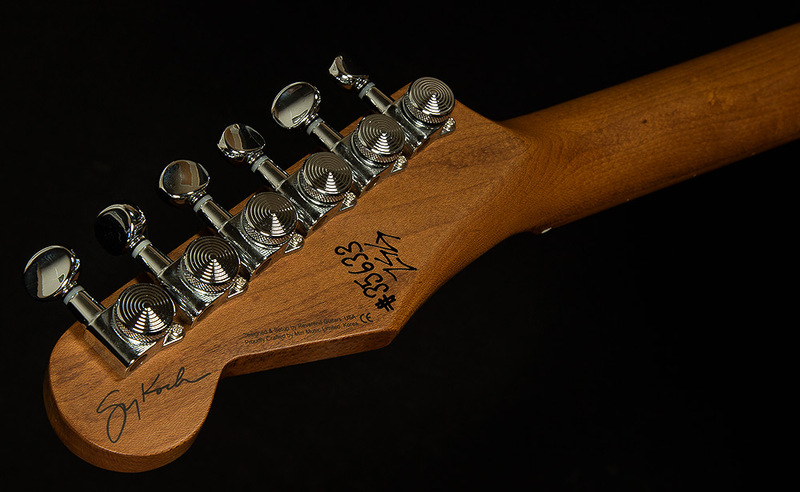 All woodland critters and guitar pickers can dig the Greg Koch Signature Gristlemaster. Wildwood Guitars invites you to take one for a spin and be transformed.